1.4 km from Ngurah Rai Intl. This family-friendly Tuban hotel is located near the airport, within 2 mi (3 km) of Circus Waterpark, Waterbom Bali, and Lippo Mall. Tuban Beach and Kuta Square are also within 2 mi (3 km). 1.2 km from Ngurah Rai Intl. 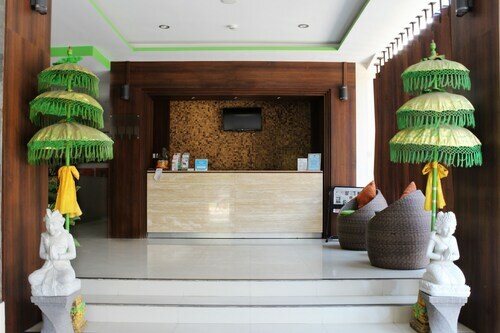 Situated in Tuban, this hotel is within a 15-minute walk of Circus Waterpark and Lippo Mall. Waterbom Bali and Tuban Beach are also within 1 mi (2 km). 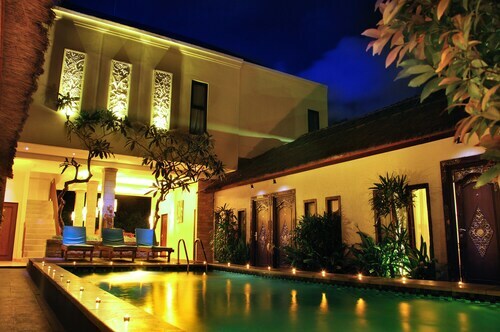 Situated in Tuban, this spa hotel is within 3 mi (5 km) of Kuta Beach, Tuban Beach, and Legian Beach. Seminyak Beach and Eat Street are also within 6 mi (10 km). 0.9 km from Ngurah Rai Intl. Located in the heart of Tuban, this spa hotel is within 1 mi (2 km) of Lippo Mall, Discovery Shopping Mall, and Waterbom Bali. 0.7 km from Ngurah Rai Intl. 1 km from Ngurah Rai Intl. 0.5 km from Ngurah Rai Intl. 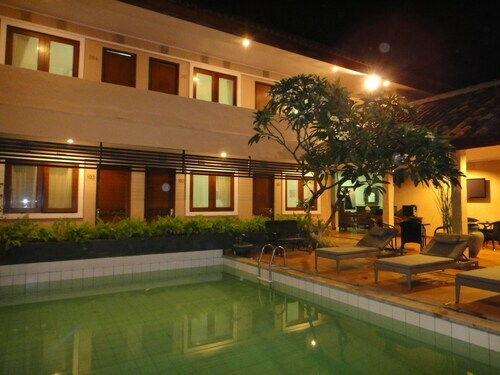 Situated near the beach, this hotel is within 1 mi (2 km) of Segara Beach, Waterbom Bali, and Lippo Mall. Tuban Beach and Discovery Shopping Mall are also within 1 mi (2 km). 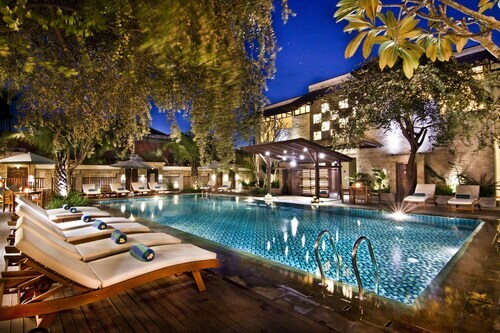 Situated near the airport, this spa hotel is within 2 mi (3 km) of Circus Waterpark, Waterbom Bali, and Lippo Mall. Tuban Beach and Kuta Square are also within 2 mi (3 km). 2.2 km from Ngurah Rai Intl. 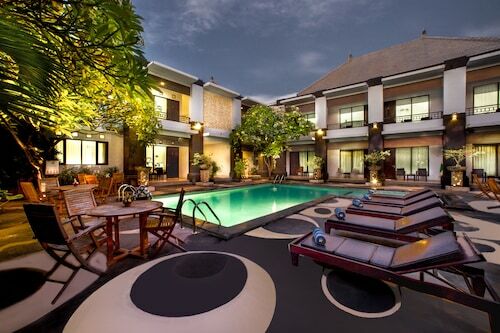 Located in By Pass Ngurah Rai, this hotel is within 3 mi (5 km) of Jimbaran Beach, Lippo Mall, and Tuban Beach. Kuta Square is 3 mi (4.9 km) away. Welcome to Denpasar! Wotif is here to figure out your accommodation from the instant you land at Ngurah Rai International Airport (DPS). Make air travel simpler by staying in one of the 3 hotels right outside Ngurah Rai International Airport. Visitors will have airport transportation (comp) at the Green Villas Hotel and Spa Bali. 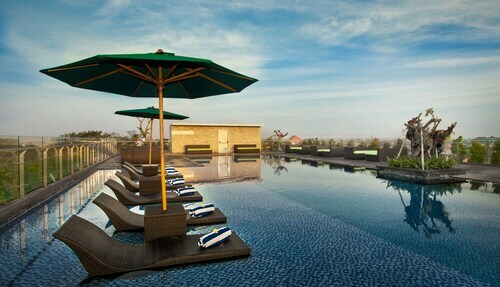 The HARRIS Hotel Tuban Bali also provides some nice amenities. 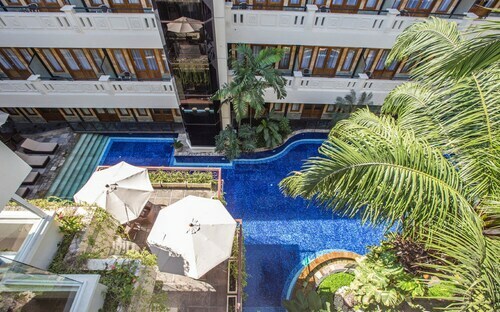 If you're wanting to witness the local areas, there are some accomodation options and amenities in the areas around Ngurah Rai International Airport. Kedonganan is located 2 kilometres away. 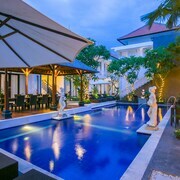 There are 97 hotel options, including the Four Seasons Resort Bali at Jimbaran Bay and the Temple Hill Residence Villa. Then again, Jimbaran Beach is 3 kilometres away. The Belmond Jimbaran Puri and the Jamahal Private Resort & Spa are great options. Even if you're only passing through, it is worthwhile checking out Kuta Beach. You can find it 2 kilometres from the airport. Now's the time! Choose your Ngurah Rai International Airport hotel and hit the skies. Is there a hotel in Bali Airport? 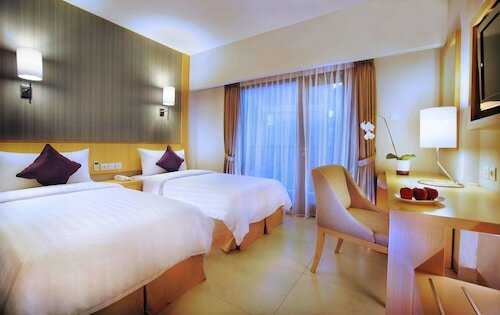 The Hilton Garden Inn can be found at Ngurah Rai International Airport inBali. Make use of the free Wi-Fi and other swanky amenities at this luxurious hotel. If you don’t mind a short car ride, secure a room at the Radiant Hotel and Spa. With their free Wi-Fi and 24-hour front desk, all your hotel needs will be catered to here.